I started playing MTG in 2013, first sliding into the fascinating world of trading cards that we all know and love in childhood. Later going on to attend business school, I have always prided myself on my “side hustles”. After playing on the FNM level for a couple years, I was forced to unload the majority of my collection in order to accommodate my career and academic progression. 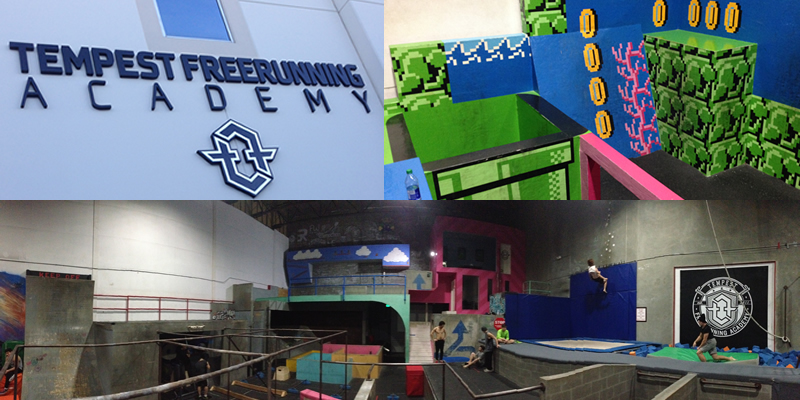 This resulted in what I call The Cube Project. This project is focused on the ‘museum effect’. 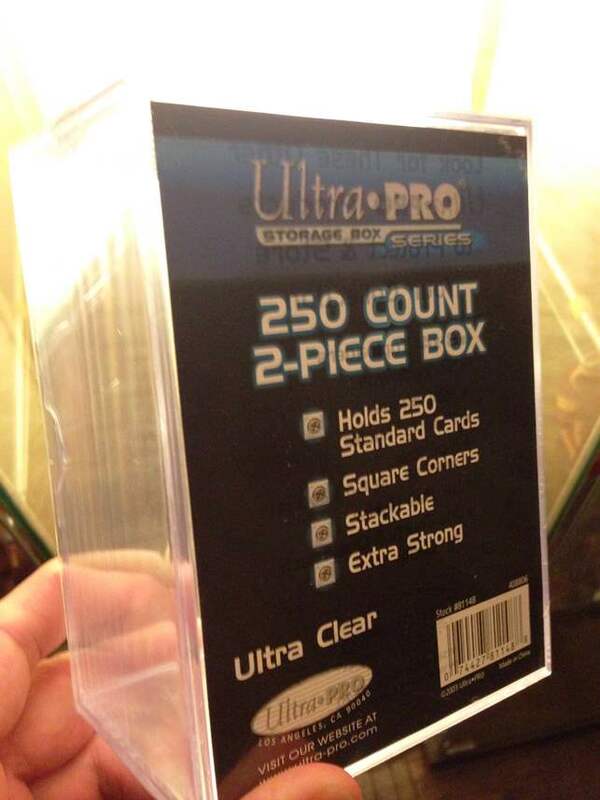 My goal is to compile the rarest of rare cards and have them on display for what will be an annual Holiday Cube Draft. These rare cards include both Alpha and Beta dual lands as well as Power 9 cards, test prints, judge foils, and other tasty goodies. To enable my acquisition of these valuable cards as efficiently as possible I adopted a technique perhaps best labelled as “value grinding”. I define “Value Grinding” as trading for financial gain rather than specific outcome. 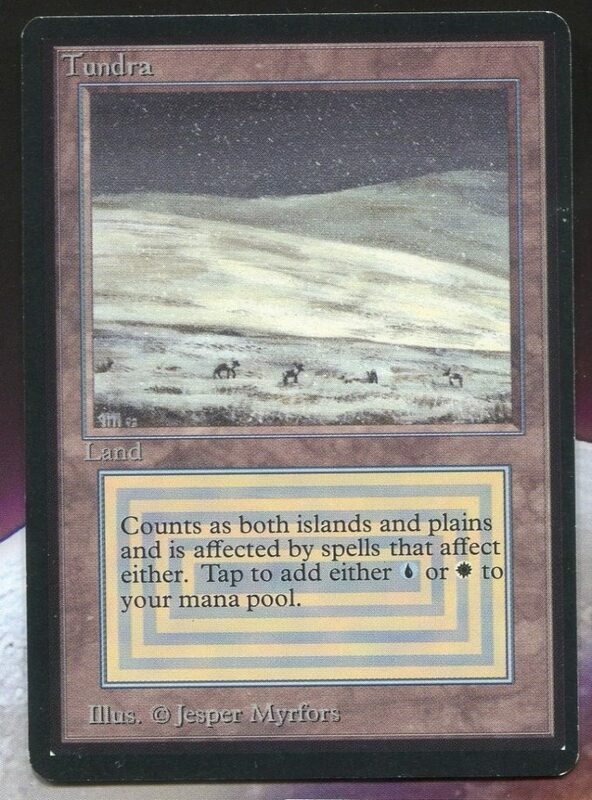 This technique requires in depth familiarity with both current secondary market prices and relative speculative potential of a long list of Magic cards. 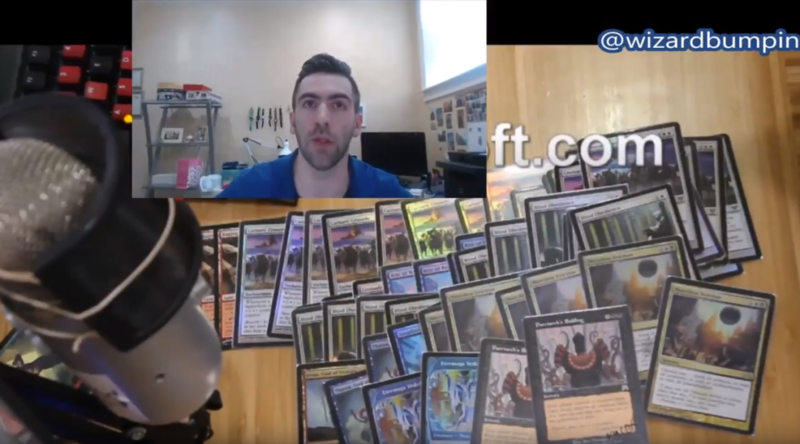 Employment of these methods has been my primary avenue for climbing the value ladder, as I have acquired high-end foils and vintage cards over the past five years. 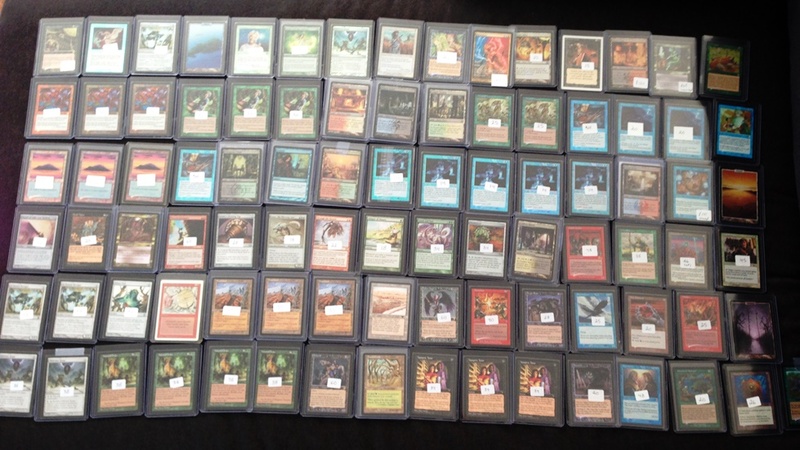 One of my proudest achievements in the Magic secondary market was paying for a large portion of my undergraduate tuition purely through speculative investment in Magic Cards and collectible sneakers. During the Return to Ravnica era cards like Pack Rat and Nightveil Specter went from bulk to $10 overnight. Arbitrage between various local stores in the area led to easy money through immediate buylisting. During this time MTG was entering the first of two Bull Markets within a five-year span. The first was Innistrad/RTR. This standard period was one of the best in recent memory due to card quality in standard. Liliana of The Veil, Snapcaster Mage, Cavern of Souls, and Shocklands were all in standard. 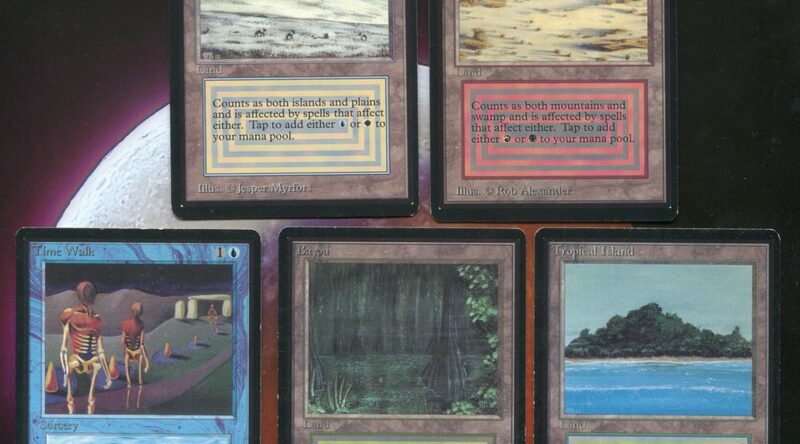 The average standard magic collection had eternal appeal due to the power level of the environment which in turn made it far easier to trade up the latter into reserved list cards. This price gap between the most expensive cards in standard LOTV ($50) and Underground Sea ($180), created a rift that pushed everything in Legacy up 100% and Modern up 75%. Grinding the gap allowed me to pay for several undergraduate classes. 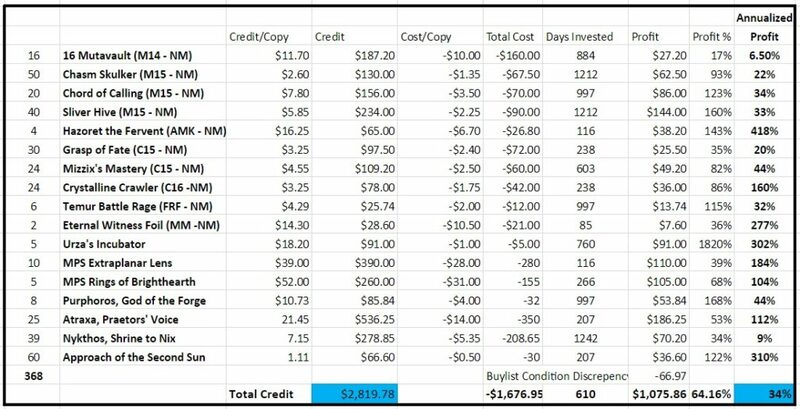 Around this time, I also started paying attention to the arbitrage available between online stores and local vendors. 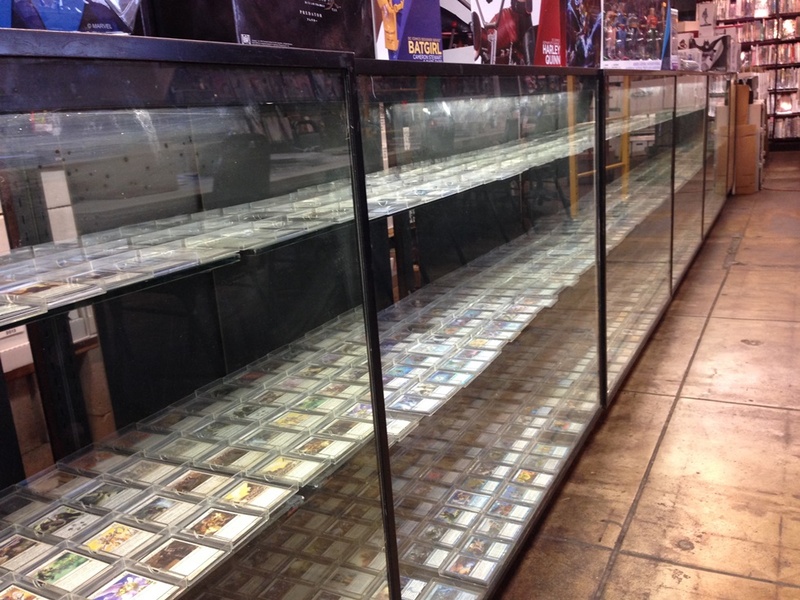 With local stores needing cash flow to survive, they often had to choose between expensive cards in the display case and inventory that is applicable to the majority of the player base. Stores all over the country need to sell cards to stay in business, the specific cards they sell are far less important. My local area had more casual players than competitive players, which meant that cards like Elvish Mystic and Doom Blade were always in high demand. With less than 1% of customers being seriously interested in cards over $100, the novelty of dual lands and power was dubious for the vendors in question but more useful to me in my expanding sphere of activity. 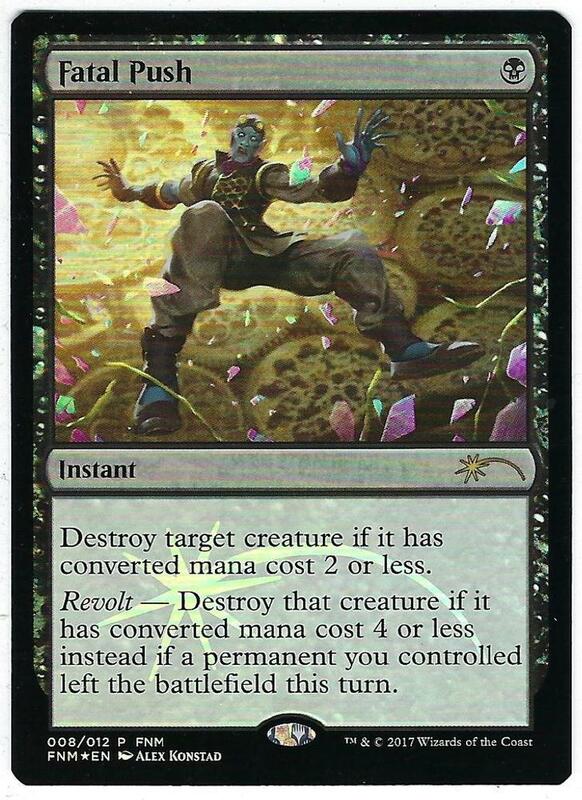 With this information I would aggressively trade down to commons and uncommons that were prevalent in the community and either buylist to stores or just outright sell online in lots of four. The key to this process was understanding the market and leaning into discounted prices on recently reprinted staples as they would near peak supply. Moving cards like this around in volume at the time was far easier to find, trade for and sell. Most competitive players would consider this draft chaff and wouldn’t be interested in trading on penny margins. 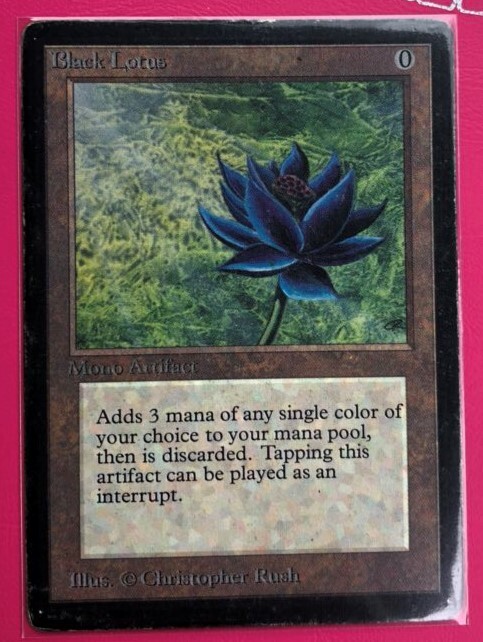 Another major milestone in my MTGFinance efforts was the acquisition of my first Black Lotus. I bought an Unlimited Lotus for $1300 in cash and $400 in trade in 2014, which at the time was more than a reasonable deal. Successfully acquiring my Unlimited Lotus gave me the confidence to move on to a more ambitious target: a Beta Lotus. Fast forward to the end of undergraduate school and I found that I would be moving across the country to take on a new job. This presented a problem. First, I wouldn’t have enough time in my new position to actively play anymore. Second, downsizing from a house to an apartment restricted the amount of inventory I could have on hand. Couple these two problems with my eventual goal of creating the best cube ever and I faced a need to consolidate my collection again from two trade binders, thousand of bulk commons and two modern decks down to just my increasingly valuable cube. During this time my buylist orders were looking something like the following, including many random cards from every corner of the magic world that many of us just leave lying around the house. You get the idea. These lists, populated by cards that are often easy to get thrown into trades or acquired cheaply from other players, would routinely result in $500-$1000 buylists orders for me. Other buylists would be hundreds of cards like this. The point of sharing these two lists is to demonstrate the value I was grinding from cards that others largely ignore and the attention to detail I practiced to maximize value. Many of us have thousands of cards in our closets but fail to realize that even the ordinary things like commons and tokens represent value we can use to move towards our biggest goals in the hobby. If there is demand then there will be a price. This journey of spending two entire days sorting cards and condensing everything I owned. Ultimately led to starting the cube on a good note. Large vintage cards like Mishra’s Workshop and Mox Ruby, only received increased market demand in the fall around Eternal weekend. During the time between the annual event, stores would place such large trade in margins that buylists became bread and butter for collectors such as myself. After 3 years of grinding tokens and penny cards. I was able to establish a nice collection of top tier cards. 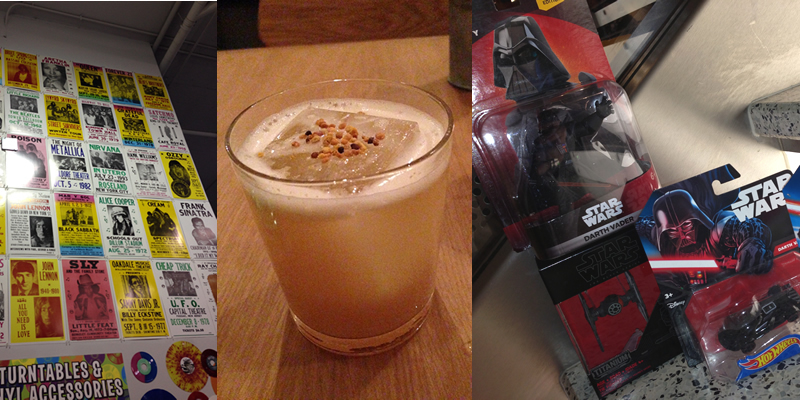 Most were intended to enter the black hole that is my cube, while others were mere placeholders for further goals. The one recommendation I would make to every magic player is to organize their collection. The amount of time you will save looking for cards is enough to sacrifice an afternoon in order to help your future self build an efficient process. I can’t tell you how many times I haven’t been able to find a specific card or after randomly looking through boxed finding a playset of Cavern of Souls I didn’t know I owned. I soon made the decision that Unlimited Power wasn’t enough. I enjoyed the feeling that the cube was almost finished but seeing the white borders made me want to cringe every time I opened a pack. I know, I know, maybe it’s pretentious but I just love the look of old black border treasure. Fast-forward to GP Seattle 2018. The event was a Legacy tournament, so not only did many of the players attempt to outshine the room with their foils, but the number of vendors in the room who brought the extra spice was insane. I visited the GP twice during the weekend. The first day was to only scout the tables and see the prices on the floor. I didn’t bring any cards, just perused the event writing down the vendors who had Beta Lotuses and the price they were asking. This was particularly important because I was able to get an objective look at the options. It is very easy to become emotionally invested in a deal and not want to get up from the table. So, to offset this possibility, I planned to handle my attendance in stages: scouting and deal making. 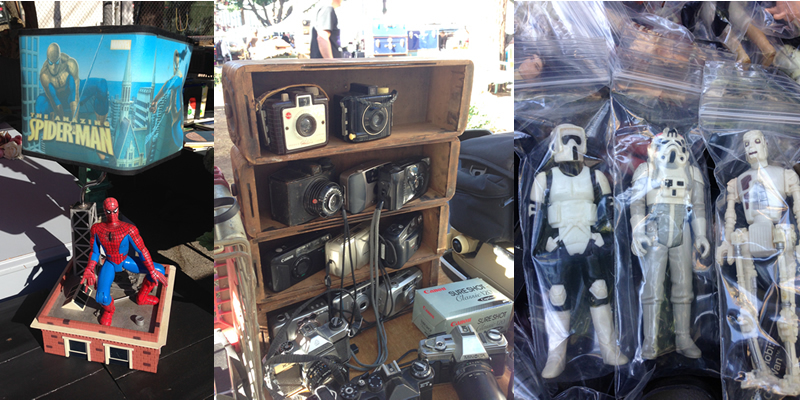 On the scouting day, I narrowed my focus down to two vendors. The first, Grey Ogre Games, had moderately played, lightly played and near mint copies ranging from $6,600 to $9,500. I knew that because this card was going to be in my cube, I didn’t need the near mint. Additionally, I already had an Unlimited Lotus that was on the border of LP/MP. For grading purposes, I would always assume MP but realistically it was fairly clean. So, at worst, I would like a condition similar to what I already had. This narrowed my options down to lightly played or moderately played. The second vendor, which will remain nameless, had one MP copy for $7500 but wanted a premium if trading for power. This initial conversation was enough for me to walk away. While the premium is a valid business decision and holding power has objectively proven to be financially correct I wasn’t interested in playing that game so I steeled myself and politely disengaged. I expected $5140 going in but was willing to wiggle because of condition of my power. 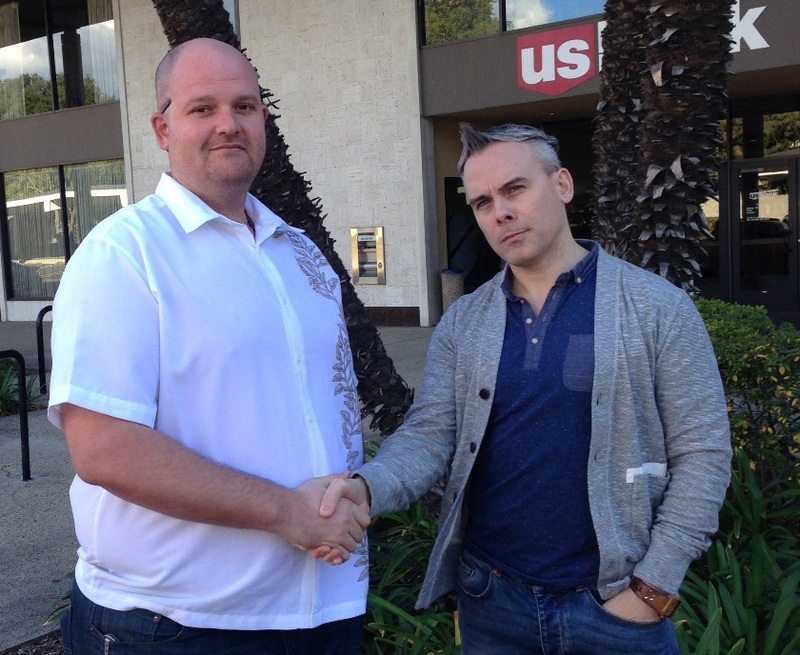 To double check my prices, I met with Jeremy from Cartel Aristocrats on site at the event. He assured me of my pricing and actually said there was a chance I would get more. I was prepared to spend upwards of $2,000 as cash additions to the deal. I was pleased to hear the price of my Unlimited Lotus was actually more than I quoted myself. There was one final aspect to settle. The final price of the Beta Lotus and to finalize the deal. 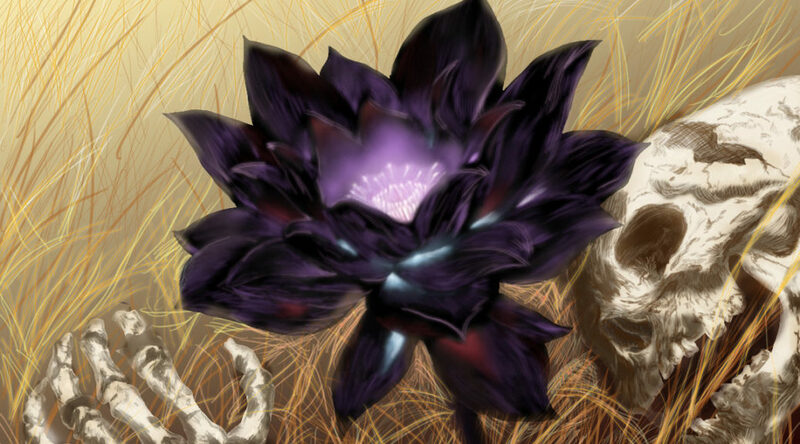 After looking at the Lotus, I found that there was some slight inking on the bottom. Ben also shared the story behind the Lotus. Apparently, some Drill Instructor at a military school disciplined child who were disrupting the class by playing games. 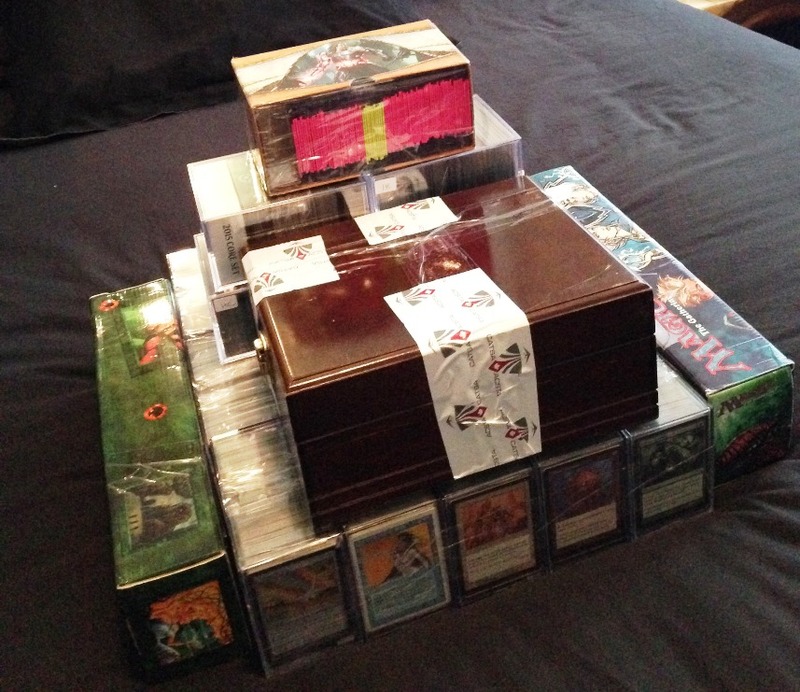 He confiscated the cards in 1994 and put them in a box in his attic. Two decades later the instructor’s son finds the cards in his father’s attic and brings them into the store. The Lotus was listed at $6,600. I asked if he was willing to take $6,000. He insisted that we roll for it. If I win I can have the Lotus for $6,000 if he wins, it goes for $6,600. Since I was fully, intending to pay the full price I thought why not. I roll a seven, and he rolls….a nine. It took me a moment to realize that we were rolling for low roll. I had no idea what was happening so I just stood there awkwardly for five seconds trying to figure how to react until Ben moves to settle up at the $6000 valuation. I paid the cash difference and left the venue ASAP, grinning ear to ear. Once again, I would like to thank Grey Ogre Games for the deal and @MissouriMTG for the advice and mentorship during the GP. And that my friends is the story of how, after four years of grinding penny cards and tokens I was finally able to lay hands on my very own Beta Black Lotus. I’ve now successfully traded for the most iconic card in Magic the Gathering, not once but twice and couldn’t be happier to have it occupying a place of pride in my cube for many years to come. 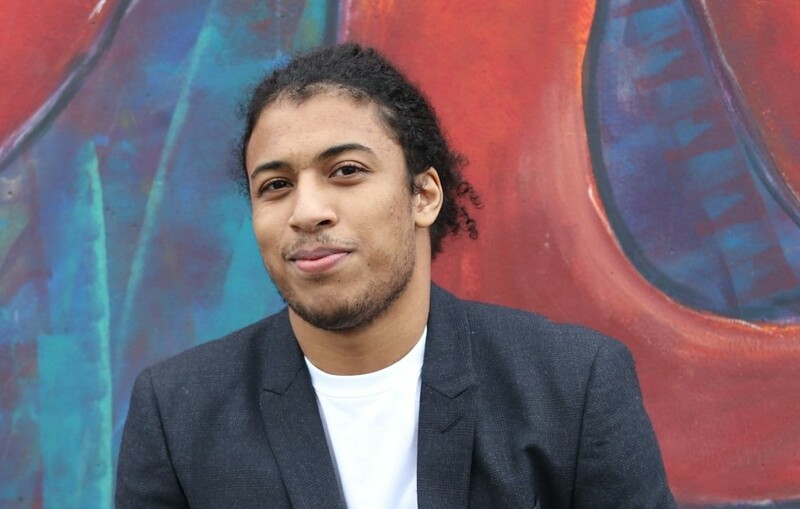 You can find Zakeel Gordon on Twitter via @ZakeelGordon and YouTube via @ZakeelGordon.